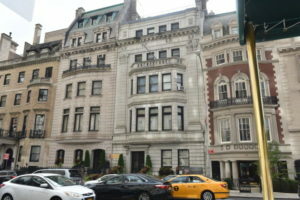 BOSTON, MA – The Greek Orthodox Archdiocese of America will take a $10 million loan, with its headquarters – the two buildings located at 8-10 East 79th Street in New York City as collateral – as was announced during the meeting at the Boston Metropolis on March 1. The meeting was called by Metropolitan Methodios in hope of providing some explanation, because there is a high degree of disappointment and mistrust in Boston after the astonishing revelations made by The National Herald about the dire situation of the finances in which the Archdiocese found itself. It was initially announced that George Tsandikos, Vice Chairman of the Archdiocesan Council, was scheduled to travel to Boston to conduct the meeting, but he canceled at the last minute, citing an emergency. Instead Rev. Soterios Baroody, CFO of the Archdiocese, Catherine Boufides-Walsh, its general counsel, attended in his stead. Regarding the loan, Baroody initially hesitated to respond, saying he didn’t know how much the loan would be and from which bank. Walsh clarified the amount and that the two buildings would serve as collateral, but also stated she didn’t know which bank would be the lender or what the interest rate would be. Methodios, a member of the Holy Eparchial Synod who is first in rank after Archbishop Demetrios, presided and offered an opening prayer. Attending were priests, parish council presidents and members, and Philoptochos members. Baroody reportedly said “the Archdiocese is not as you know it,” referring to instances when the organization did not have funds even to issue a $100 check or mail letters. It is reminded here that the Herald had revealed that UPS and Federal Express refused the Archdiocese’s credit and would provide services only upon cash on delivery. Reportedly, Walsh made an indirect reference to ousted former Executive Director Jerry Dimitriou, stating there was only one person responsible for the finances, the budget, the payroll, and accounts payable. Also discussed was rampant use of credit cards and mobile phones with no checks on expenses. The attendees remained speechless, and after the meeting acknowledged to one another these revelations made public by the Herald. It also became known at the meeting that the audit of the Archdiocese was conventional, not forensic. Only the audit regarding the St. Nicholas National Shrine is forensic. It was said money from the St. Nicholas restricted accounts was transferred to the Archdiocese’s operating accounts to cover expenses, though Baroody and Walsh did not indicate how much. Baroody added that the Archdiocese sent its allocation to the Ecumenical Patriarchate as well as to the Holy Cross Theological School. Fr. Peter Giannakopoulos, presiding priest at St.George in Hyannis Cape Cod spoke extensively and to the point about the financial situation, especially about the issue of the Clergy Pension Fund telling Baroody that the Archdiocese had not put $654,000 into the fund. Baroody disputed the amount, saying it would be best to wait until the audit is over to see if the amounts are congruent, but Giannakopoulos said he knows what is going on because he worked as a comptroller. Didn’t the GOA recently report that the financials were in order? Wow! When will this end? The people need to physically rise up at this years ckergy laity conference. What has been done to date is NOT enough. I’m very saddened for my church. My cousin left GOA years ago and joined OCA, I’m considering doing the same. The problem is that the GOA is just not Greek enough, not ritualistic and mechanical religionist enough, not systemically corrupt enough , not cultic enough, not spiritually dead enough, not criminal behavior covering up enough and not proud and arrogant enough. Once it gets really problematic by these means then the church can crash and burn and with the potential humility that brings see itself as it really is in the mirror of God and repent. At that point the metropolitan’s, the patriarch, elder ephraim, L100 and the Archdiocese Clergy/Laity Council can lead the church back to God and out of systemic corruption and cultism. Those who led the church into the problems can lead it out of them. Those who create problems are those who are best capable of solving the problems they create. Do not remove those who are the problem when they are the solution to the problem. That would not be GO rational or logical. Anyone who would try to remove a problem hierarch will be made the problem. That’s basic Greek Orthodox church administration 101. This form of church administration is a Greek church tradition and we all know how serious the GO take practicing their traditions. In other words, nothing is going to change unless reform of the structure and system of church administration changes along with removing those in leadership that will not reform. That needed reform will not be coming. The structure and system and thinking and attitude of the hierarchy will not allow it. Circular without solution is the GOA administration. The problem is not the solution to the problem unless you want more problems. Seems the GO want more and more problems. Jesus Christ is about transformation that reforms us to His mind and heart in a continual process over time. The GOA has no real transform to reform process and that is why it is dying as an archaic museum of dead church ritualistic and mechanical religion gone systemically corrupt and cultic. The very thing it believes can be used to save it that is what is killing it dead. The hierarchy and the internal processes that creates them and the structure and system that protects them is not the solution. It is the problem. Tradition legalism rules over Christ transforming freedom and the GOA goes spiritually carnal, then it goes corrupt and then it goes dead, it dies as a church. What, ethnic food festival is not a tradition that has nothing to with the Gospel of Christ and leading others to Christ’s salvation? That’s just for starters. The seven last words of dying church are, we have always done it this way.